Not knowing if the future will bring it more launch business, the workhorse Delta 2 rocket successfully deployed a vital climate and weather observatory this morning before riding into an uncertain state of limbo. The United Launch Alliance-made rocket, one of the world's most reliable space boosters ever built, pierced a star-filled sky for its middle-of-the-night ascent to deploy the NPP spacecraft. 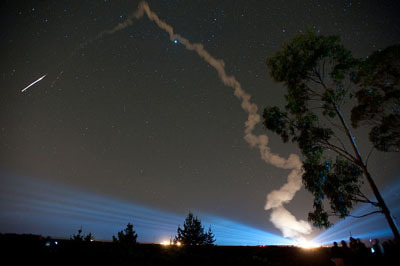 Liftoff occurred from Vandenberg Air Force Base along California's central coastline at 2:48 a.m. PDT (5:48 a.m. EDT; 0948 GMT). Balanced atop more than 700,000 pounds of thrust from its kerosene-fed main engine and strap-on solid-propellant motors, the 12-story vehicle pitched southward and rapidly accelerated, breaking the sound barrier in just 32 seconds. Six solid motors lit on the launch pad burned out a minute into flight and three remaining boosters were ignited in mid-air for the planned firing. Once the solids had done their jobs and dropped away, the first stage powerplant continued pushing the rocket, eventually reaching 65 nautical miles in altitude four-and-a-half minutes after liftoff. The slender blue stage successfully jettisoned as the hydrazine-fueled second stage began its crucial firing that carried the payload into an initial orbit around the planet. Then it was time for the Delta to just coast, cruising above the South Pacific, around Antarctica and toward Africa over the course of about 40 minutes. Once in the correct orientation just south of Madagascar, the second stage commanded its engine to perform a brief burn that propelled the orbit into a planned near-circular, sun-synchronous one. Latches restraining the satellite to the rocket motor let go 59 minutes into flight and freed the spacecraft to float away for the start of its mission to monitor Earth's environmental pulse. "It's not just another satellite, it's actually a big deal for America," said Mary Kicza, NOAA's assistant administrator for satellite and information. The satellite will serve as a stopgap between the U.S. government's current polar-orbiting satellite constellation and the next generation now in development. "These operational weather satellites provide 24-by-7, and 365-days-a-year coverage of the planet for accurate and reliable weather forecasts," Kicza said. NPP is flying five instruments, including four that are advanced versions from previous eras. The sensors will be evaluated on NPP for their inclusion in the future program that hopes to begin launching NOAA's new-era observatories in 2017. "These instruments and this mission represent a significant advancement in technology including higher resolution imagery and profiles and faster data rates. NOAA will use the data captured from these instruments to feed into computerized weather models, enabling our forecasters to predict the next tornado outbreak or tropical storm days in advance, and to note how much snow is going to fall or where conditions are most favorable for wildfires," Kicza said. "Even beyond weather, NOAA will use NPP to help track ash plumes from volcanic eruptions, to accurate measure the amount of Arctic sea ice and changes in the ozone hole, to monitor phyidoplankton and other organisms in the oceans. What's more, NASA plans to use the data for its long-term research on the changing climate and environmental trends. "These kinds of satellite observations with multiple sensors on them help put the story together. I like to think of the Earth as a mosaic of stories -- a lot of little stories telling one big, very important story," said Waleed Abdalati, NASA's chief scientist. NPP is expected to send back four terabytes of data daily, which is equivalent to 800 DVDs of storage, according to Ken Schwer, the project manager. "NPP has touched so many lives already and my team is ready for NPP to touch the rest of the world with climate studies, enhanced weather forecasting and monitoring of critical events," Schwer said. "NPP's bumper sticker could read, 'NPP -- Our planet's lifeguard." For the Delta 2 rocket, today's flight was the vehicle's 151st over the past 22 years and extended its reliability record to 98.7 percent. Although five additional rockets are available in inventory for sales, there are no further launches are currently booked, creating a sense of uncertainty about its future. Despite not knowing when or if another Delta 2 will fly, program officials avoided calling too much attention to the NPP launch as potentially the rocket's last. "We're trying to tread a fine line there. We recognize it's the last contracted, which means something to us because here we are in 2011 and we know even if future Delta 2's are contracted they're not going to occur for a few years. 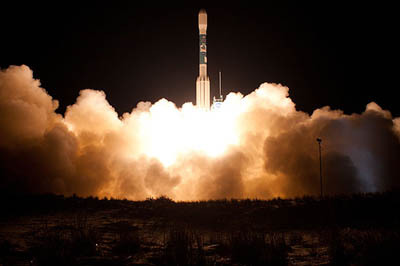 But it's not a celebratory end of the program type of occasion for us," said Tim Dunn, the NASA launch director. "We definitely prefer not to call it the last Delta 2. The last contracted Delta 2 is totally accurate, but we certainly hope at ULA that it's not the last," added Vernon Thorp, ULA's program manager for NASA missions. The remaining vehicles could be purchased by the U.S. government or commercial satellite operators to haul upcoming payloads to orbit, specifically smaller-weight spacecraft currently being built that would be suitable fits with the Delta 2 to reach polar orbit from Vandenberg. "There's no formal competition happening right now, but there are programs within NASA who are interested and there are discussions taking place within NASA. That's probably about all we can say about that," Thorp said. "And I can tell you ULA has been contacted by both NASA and potential commercial customers inquiring about the availability. So there's preliminary discussions going on." The marketplace indicates what possible business Delta 2 could win would need Vandenberg as the launch base for high inclination orbits and not Cape Canaveral's equatorial orbits. "It is likely -- almost certain -- that any future missions would launch from Vandenberg, and I think the most likely timeframe that we are looking would be the 2014-2015 timeframe," Thorp said. 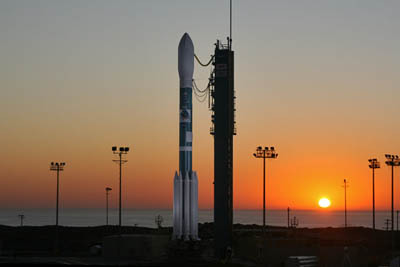 See our story from earlier this month on the Delta 2 rocket being re-accepted into the lineup of rockets NASA could buy. As for Space Launch Complex 2 at Vandenberg, that pad would have to be maintained to support any future Delta 2 flights from there. "ULA has an obligation to keep it in shape, if you will, to keep maintaining it for 90 days after (NPP's) launch. Depending on how things shape up, if it looks by that time, by the end of that 90 days, that there are some definite possibilities (for future launches), then we'll continue maintaining it," Thorp said.